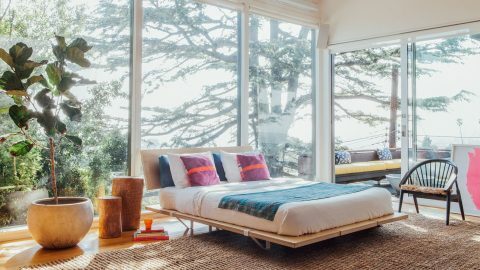 It looks absolutely beautiful, but I once stayed in a room with a similar bed, and I knocked my shin on it so many times! It caused a lot of bruises. Something to be aware of if you’re thinking of buying. Elizabeth, that’s the same exact thought I had when I saw this… banged up ankles. Ouch! A bit of tube styrofoam, slit and slipped over the edge would probably do the trick.